Chassis, agricultural machinery and industrial, MOP and lubrication in general. Contains EP additives of latest technology. Prevents rust and corrosion in areas of contact metal/metal, under heavy loads and extreme pressures. PGrado NLGI: 2. Classification ASTM D4950 "LB" for use in the automotive industry. Grease EP multi-functional enhanced by the plastic deformation of their microaditivos and formulated for lubrication under harsh mechanical conditions and major cadences in the frequency of lubrication. Free of filling materials, fillers and heavy metals. - For all types of bearings working with heavy loads, vibration, or in the presence of moisture. - In bearings for smooth, even alloys yellow, that work with heavy loads or partial rotation with abrasive wear. - To protect the development of vibro - intensive, or accelerated wear of bearings and grooves formed in the transmission type u-joint boards and tongue-in-groove with high torque. - Lubrication in the rolling mill or calandras by pads slip. - Ensures a cost-effective maintenance through the reduction of costs for repairs or lubrication. - High anti-wear, anticorrosive, antioxidant and antiherrumbre. - High adhesion and stickiness. - Service temperature of -20 ° c to +120 ° C, (-4ºF to +248ºF) with tips of 135ºC (275ºF). Maximum temperature of application, recommended for bearings depending on the speed factor. - Excellent pumpability down to use with pistol and the central lubrication. The fat MAXIGRAS C45 EP can be applied by means of a pump of grease, brush, or spatula. It can also be pumped through automated systems, in consultation with the manufacturer. 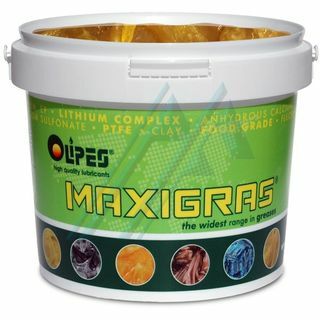 MAXIGRAS C45 EP is compatible with any grease of the same base (thickener and oil). In case of doubt, consult our technical department. Cartridges of 400 g, containers of 5 L, 20 L and drums of 50 and 200 L.